This article explores Android Nearby, showing how to integrate Android and Android Things. There are several strategies we can use to integrate Android and Android Things, Android Nearby technology is one of them. Android provides a set of API that simplifies the data exchange between two different devices. One interesting aspect is the Android Nearby supports also iOS operating system. Android Nearby Messages: This uses a publisher/subscriber paradigm to exchange simple payload between two different Android devices. This article covers Android Nearby Connections. The main goal is showing how to send data from an Android smartphone to an Android Things device. Then the Android Things device displays this information using an LCD display connected to Android Things. Once the Discoverer has found an Advertiser they can establish a connection and exchange data. Under the hood, Android Nearby API uses a set of technology to establish the connection between different devices. It can be Bluetooth or Wifi. The API leverages the strength of each type of technology to guarantee a reliable connection. The developer and the user do not have to worry about it, it is completely transparent. In this Android Things tutorial, we will use P2P_STAR topology. Let us start implementing the advertiser. This Android tutorial assumes you have installed Android Things on your device. If it is the first time you approach Android Things, you should read this tutorial to know how to get started with Android Things. The first step is implementing the advertiser using an Android Thing device. In this case, we will use Raspberry Pi 3 but you can use other prototyping board compatible with Android Things. where "Android Things" is a nickname while SERVICE_ID is the id of our service. Usually, the SERVICE_ID is the package name of our application. The other parameter connectionLifeCycleCB is a callback class. Notice that Android Nearby has a new set of APIs. When we create the advertiser we do not need to use the GoogleApiClient anymore. Using this code the Android Things app accepts all the incoming connection without using an authentication mechanism. It is possible to authenticate the client so that we can apply some security policies. The last step is incoming the payloadCallback so the app can handle the incoming payload. This is the last step of the Android Nearby advertiser. The Android Things app has to implement the PayloadCallback interface to read the incoming payload. In the onPayloadReceived, we will handle the LCD display to show the payload content. 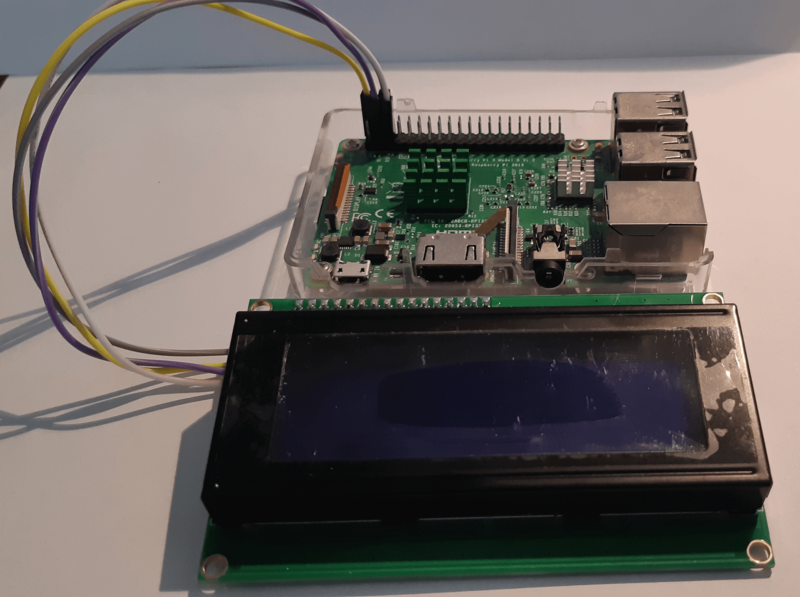 Later, we will handle the LCD display connected to Android Things so that it can show the payload content. You are ready to start the app. To this purpose, you can use a compatible Android Things device. In this tutorial, we will use an Raspberry Pi 3 running Android Things 1.0.3. In this paragraph, we will describe how to implement the Android app that plays the discoverer role and sends data to the Android Things app. The steps to implement this app are almost the same used previously to implement the Android Things Nearyby app. Let us start creating a class named NearbyDsvManager. This class will manage all the details to discover, connect and exchange data with the Android Things app. In this method the discoverer requests a new connection using the endpointId discovered in the previous step. Moreover, it adds a new callback interface to know when the connection is established or there is an error. Moreover, it is necessary to create a new class that will handle the LCD connection details and all the step to display data. 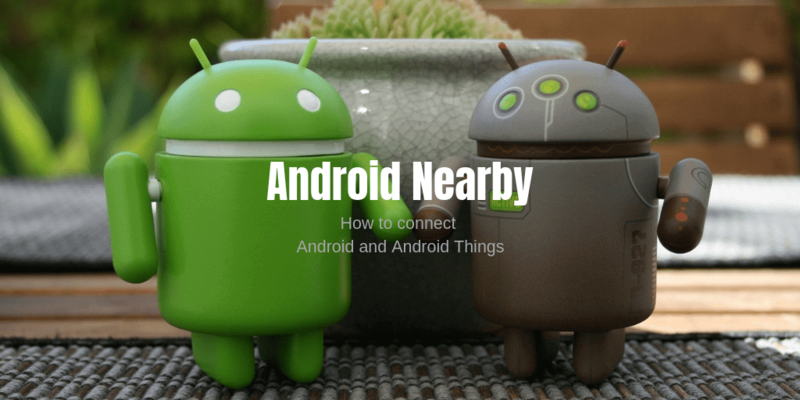 At the end, this article showed how to use Android Nearby to connect different Android devices. This tutorial used Android Nearby to connect an Android app and an Android Things app so that they can exchange data. Moreover, Android Things uses an LCD connected to it to show the payload coming from the Android app. Hopefully, you gained the knowledge about how to use Android Nearby advertiser and the discoverer and how to connect them following the Android Nearby specification. Very detailed & nice article. Thanks for taking time to write & publish with us. Thank you very much. Do not forget to share it?? Unable to use Nearby connections for a iOS app as a discoverer. Is this correct? Is there no way to use iOS device to connect to and configure android things device for wifi setup? I’m sorry i don’t have experience on iOS devices. I’ve just used Nearby in Android. Anyway if you are connecting an iOS device to Android Things to configure the WiFi, this is not possible.